What I thought would be a wonderful heartfelt story of a family coming back together … wasn’t. When the Rockwell sisters—Esme, Liv, and Ru—were young, their mother, Augusta, silenced talk of their absent father with the story that he was an international spy. Fast-forward to present day and Esme is navigating a failing marriage while trying to keep her daughter from live-tweeting every detail. Liv finds herself in between relationships and rehabs, and Ru has run away from enough people and problems to earn her frequent flier miles. When Hurricane Sandy hits the family home on the Jersey Shore, the Rockwells reunite—only to discover that the storm has unearthed a long-buried box. I felt nothing while reading this book except an eagerness to finish. I wonder now how I did manage to finish. There must have been something there keeping me intrigued. Though for the life of me I can’t figure out what that was. I disliked each of the characters. Each character fell flat and underdeveloped, in my opinion. Some of the happenings were far-fetched and too easily fixed without a proper explanation … especially one comment made by Augusta. She mumbles something under her breath and I think “Oh! This is going to get interesting!” But it goes no further! It’s never discussed or brought up again. It would have made the more interesting story. Usually if I’m on the fence about rating a book, the Epilogue helps me decide. It certainly did in this case … I hated it! I couldn’t understand why the author felt the need to update us on characters that I didn’t consider a factor in the story at all. Readers all have differing opinions. This is mine. You might love this book but it just wasn’t for me. ARC provided by NetGalley in exchange for my honest review. I’ve always been a reader. However, it wasn’t until I bought my first Kindle (a keyboard) in 2011 that the obsession really started. And it really has become this huge obsession. So much of my time is dedicated to reading and talking about reading. Goodreads and NetGalley … I had no idea they existed before getting a Kindle. Now I check these web pages multiple times a day. Who knew I would read so much, want to read so much that I would need a way to track what I’ve read, haven’t read, or want to read via Goodreads. I had no idea there were sites like NetGalley out there that would allow me to get books for the purpose of writing a review! I didn’t know what ARC or dtb stood for. Now you may be wondering what they stand for, right? ARC is an Advanced Readers Copy and a dtb is a dead tree book, a physical copy. Book signings and autographed books … not something I’d ever considered important before. I now have several autographed books and have attended 3 book signings. Authors are my celebrities! What really makes reading worthwhile though are the many friends I’ve made because of reading. Some of these people I’ve never even met in person but they are some of my favorite people. I’ve found readers to be the nicest people. Book friends have introduced me to new authors and genres I may never have discovered on my own. Reading is an escape and something I truly enjoy. I don’t think I’ll ever get tired of talking books. And now I’m contributing to a blog! I can’t begin to imagine where this reading journey will take me next! My heart! 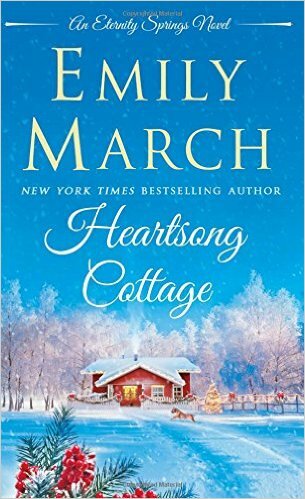 Heartsong Cottage is emotional, intense and suspenseful … great addition to the Eternity Springs series. Haunted by the loss of his wife and son, Daniel Garrett left the police force to devote his life to finding missing children. But he still hasn’t found a way to mend the wounds of his past-until he attends a wedding in Eternity Springs. Shannon O’Toole isn’t looking for romance. Ever since her fiancé’s death, she’s created a quiet life for herself. Still, she can’t deny her attraction to the handsome, broad-shouldered stranger. Daniel makes her feel things she’s hasn’t felt in years. But can Shannon trust a detective when doing so could bring danger to her cottage door? Heartsong Cottage is Book #10 in the Eternity Springs series. Haven’t read the rest of the series yet? I recommend you do but I don’t think it will take away from the reading of this story. By reading the rest of the series you’ll have the stories of the other characters you’ll read about here. I loved Daniel and Shannon together. I thought them to be believable characters. There stories were believable and pulled at the heartstrings and even made me gasp out loud once or twice. I can’t wait to see what’s up with them in the next book in the series. Fans of this series won’t be disappointed. New readers of Ms. March will be hooked and eager for more.